My first two weeks at the Truman Library have been very productive so far, in which I have begun working on two substantial projects. I would like to share my first project with everyone today. 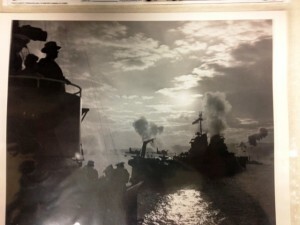 I have been assigned to digitize and catalog a collection of photographs from a collection belonging to the U.S. Navy and from a personal friend of Truman’s. After the cataloging is complete, these photos will be available to the public online. The collection is diverse, but many photos are from a substantial event that I was unaware of until I started working with the collection. Many photos are from Navy Day, October 27, 1945 in New York City. Many thousands of people were in attendance to honor the Navy and triumphant end of World War II. A short video of the event can be seen below. Many of the photos show Truman and other dignitaries aboard the USS Missouri, among many other photos showing the thousands of citizens coming to see the President and witness the events. Being able to catalog and make these photos available online provides a great service to the public, and they will be able to see many new images for the first time of this exciting event. Pictured from this collection is President Truman aboard the USS Missouri observing the naval fleet. As the evening sun sets, it casts that very familiar silhouette of the president that has ultimately become his trademark image. This entry was posted in HistoryMaking and tagged Truman Library and Museum on September 18, 2014 by Chad King. The Nelson Atkins is looking for 8-10 volunteers to help with exhibit evaluation at the Opening Celebration of the Plain Indians (Sept 21st) exhibit and 4-5 volunteers for the event Bark in the Park (Oct 11th)! Your Role: You would interview families at one or both events, to learn how they found out about the event, if they are satisfied with the event, how often they visit the museum, etc. So, you would need to feel comfortable approaching strangers and engaging them in conversation. This interview does not include any questions that could make the visitor uncomfortable, and the only personal questions we ask are for the visitor’s age, and the age of their children (they will have the option of giving us their name and email if they want to participate in a follow-up email survey). Of course, these interviews are optional – visitors can say no! This type of large-scale event evaluation is pretty new, so any experience with it is good for your resume! We will train you on social science interview techniques, which could come in handy for your own thesis. (Training will happen 30 minutes before the event starts). There is an opportunity to volunteer in an ongoing capacity as a Visitor Research Volunteer at NAMA – this is a chance to try it out and see if you like it. How to get involved: Please email Jenn Holland (evaluator at the Nelson-Atkins) at jholland@nelson-atkins.org to express your interest and/or if you have any questions. You may volunteer for both events or just one, whatever works best for your schedule. Positions will be filled on a first-come, first-serve basis. This entry was posted in Open Internships and tagged Nelson-Atkins Museum of Art on September 15, 2014 by Chris Cantwell. Greetings! My name is Chad King and I am a graduate student in the Department of History. I have received my B.A. and M.A. in political science here at UMKC, and I have since decided that a career in history is my true calling. I study American political and legal history and how politics and law have changed our society. My focus centers on the American presidency and the federal judicial system. My interest in the presidency led me to work at the Lyndon B. Johnson Presidential Library in Austin, Texas in 2013, and I have just stated an internship at the Harry S. Truman Presidential library in their archives division for the fall semester. I will be working on quite a few projects that I find very exciting. I will be working with the photograph collections and creating digital files that will soon be available for the public to access online, and I will also be working with the Truman Map Room collection in preparation for and exhibit to be showcased next year. This will be a very exciting and rewarding experience for me, and look forward to sharing more in the coming days. This entry was posted in HistoryMaking and tagged Truman Library and Museum on September 15, 2014 by Chad King. HALO International Research Ambassador Position Available: The HALO Foundation is seeking a qualified candidate to live and work abroad as an International Research Ambassador. The Research Ambassador will be expected to serve approximately 6 weeks in each Nicaragua, Guatemala and Haiti for a minimum of 18 weeks abroad total. The position will begin in 2015. The candidate will have the opportunity to apply for an extended Ambassador role upon the completion of the initial 18-week commitment. The HALO Foundation Mission: Empowering youth in the greatest need to become contributing members of their communities. Individuals applying for this position must be passionate about helping youth in need and poses strong leadership ability. Must be comfortable working independently and in a team atmosphere, highly motivated, enjoy brainstorming, and take the initiative on all projects. Strong writing and communication skills are highly pertinent. Experience working in the International non-profit sector is encouraged. Excellent opportunity to gain a variety of experience. Candidates should have a clean driving record, must pass a background check and must be proficient in Microsoft Word, Excel and PowerPoint. Training will be provided. Interested individuals can contact ambassador@haloworldwide.org for more questions. To apply for the internship, please follow the instruction on the How to Apply page. This entry was posted in Open Internships on September 4, 2014 by Chris Cantwell.